Transmission Maintenance in Addison, Illinois: What Does it Entail? Your vehicle’s transmission is vitally important to its overall performance. If your transmission dies, your vehicle essentially dies with it. It’s for this reason that you should carry out regular maintenance on your transmission. The question is: what type of maintenance is needed? What does transmission maintenance in Addison entail? Read below to find out! One of the biggest parts of maintaining your transmission is changing its pan gasket. This is the component located at the edges of the transmission pan. It is responsible for keeping transmission fluid sealed within the transmission. Over time, the pan gasket tends to wear down. In some cases, it will deteriorate to the point that it allows transmission fluid to leak out. If transmission fluid begins to leak, your transmission will soon start to malfunction. If your pan gasket is still in decent shape, you can simply clean it and reattach it. If, on the other hand, it’s worn down and deteriorated, you’ll likely need to replace it with a new one. Over time, your transmission will take on a great deal of grime and sludge. While a small amount of grime and sludge won’t affect your transmission, a large amount will. For this reason, it needs to be cleaned out every once in a while. Cleaning a transmission involves scrubbing down each and every one of its components. These components include the pan gasket, the transmission pan and the transmission casing, to name a few. In order to clean the transmission thoroughly, you’ll need to drain its transmission fluid. 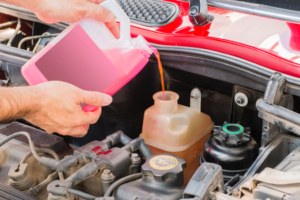 If you’ve never drained transmission fluid before, it can be a challenge. That’s why, for many individuals, it’s wise to utilize the services of a professional transmission repair company. As noted above, over time, transmissions take on a great deal of sludge and grime. While some of this sludge and grime ends up within the transmission itself, much of it ends up on the transmission filter. Because of this, it’s recommended that you change your transmission filter from time to time. Allowing a dirty filter to remain can put loads of undue stress on your transmission, causing it to work harder than it otherwise would have to. In order to replace your transmission filter, you’ll need to remove the transmission pan. While this is a fairly easy task, it can be a challenge for unseasoned individuals. If you run into troubles, you should seek a professional transmission repair mechanic. In order to change your gasket and clean your transmission, you will first have to drain, or flush the transmission fluid contained within it. This means that, after most of your maintenance responsibilities have been completed, you will finish by adding fresh fluid. After all, clean transmission fluid is vita piece of the puzzle when ensuring your transmission runs properly. When adding fresh fluid, it’s important that you use the right type of fluid. Every vehicle has different needs in terms of fluid type. It’s also vitally important that you fill your transmission to the appropriate levels. If you overfill or underfill, your transmission will react poorly. Are you in need of professional transmission maintenance in Addison, Illinois? If so, King Transmission is the company to call. Our team of highly-skilled and certified mechanics is well-versed in the maintenance and repair of all types of transmissions. Regardless of the make and model of your vehicle, we can help you.